I don’t know what the weather is like in your neck of the woods this month, but we’re already reaching some pretty high temps here in south Alabama. All of this gorgeous sunshine is really warming things up, and I can absolutely tell that this summer is going to be a scorcher! Just last week we had a few days where the temperature reached the 90’s, but luckily we haven’t had much of the usual horrible humidity hitting us just yet. The weather has been perfect for us to roll up our sleeves and get outside in the sun to play! We’re currently in the process of building a home right down the road from our current house. My husband and his dad are doing much of the interior work themselves, so our afternoons are spent at our construction site playing and “helping” just so we can get a little family time in before the day is over. 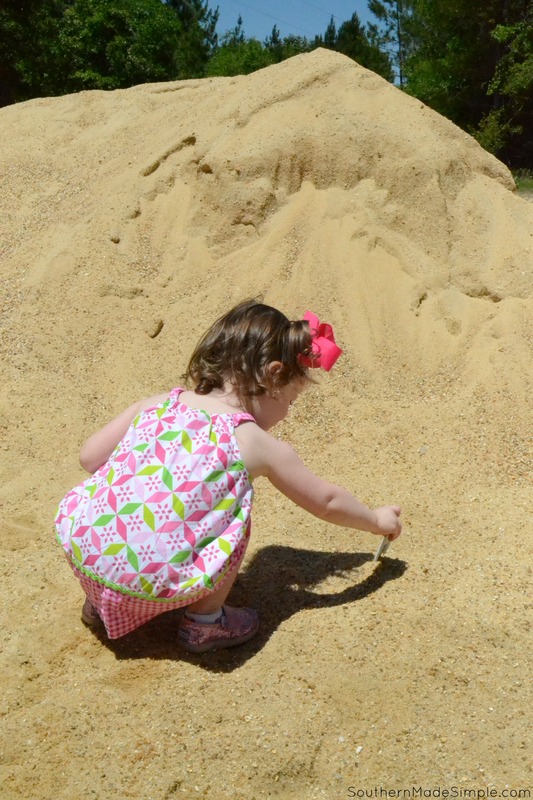 It didn’t take long for my toddler to find the two giant sand piles sitting in the yard once construction began, and they’ve been a huge source of entertainment for her nearly every day since we broke ground back in December! As much as I like to watch her use her imagination and play in the sand piles, I’m really not a fan of them for a number of reasons. The sand is full of tiny pieces of gravel, and it’s really rough on the skin. Bug and critters like to take up residence in it, and it always finds a way to creep into every little nook and cranny of my daughter’s clothing and body. She really loves playing in it, and she’s not afraid to dig right in! It seems like I’m always dumping sand out of her shoes and cleaning it out of her hair. 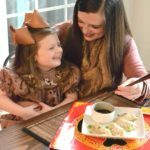 That’s a toddler for you, though! Plus, the piles are out in the middle of the yard, and it’s a fairly long distance away from any sitting area with shade. Being in the sun is fun and all, but it really makes this mama tired – not to mention fearful of all of those harmful rays! So a few days ago as I was sitting in the dirt watching my daughter dig in the sand, a thought occurred to me: What if I could make a designated play area for my daughter to play in that was close to the house, free from gravel and bugs and can be moved out of direct sunlight if need be? That’d be a dream! 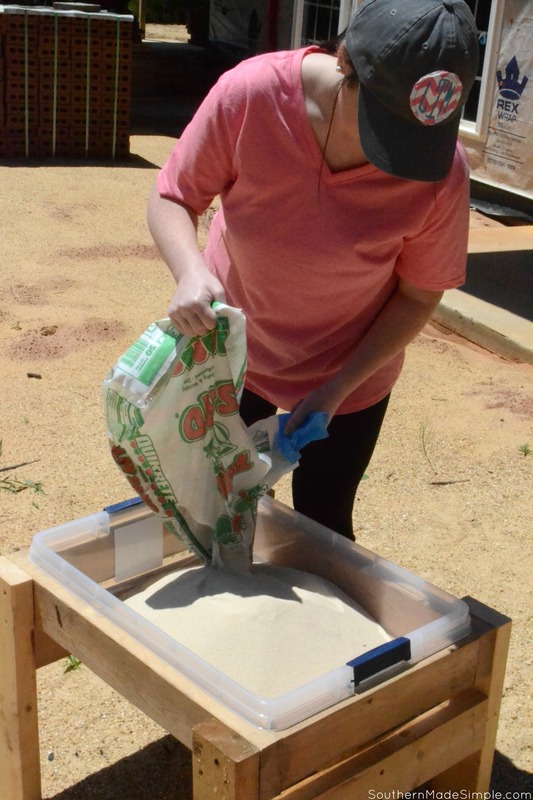 So I channeled my inner DIY-queen and concocted a plan that would give my daughter a safe place to play with her beloved sand while she’s out at the construction site. 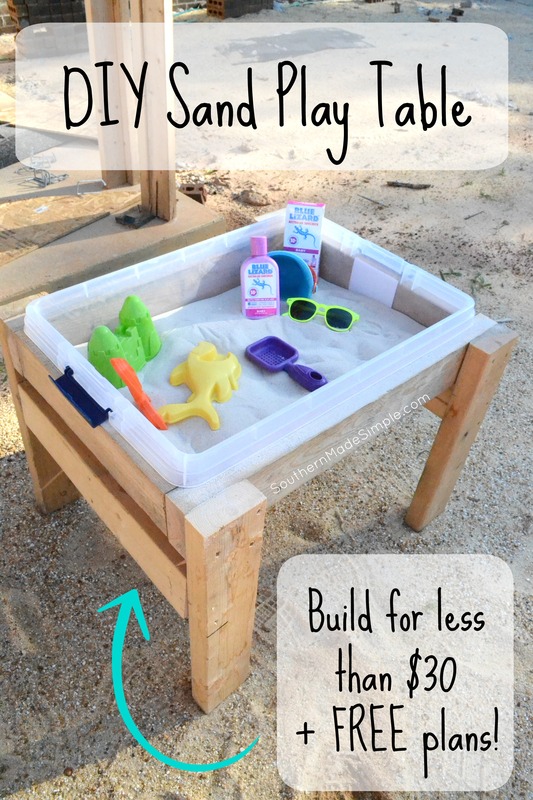 A DIY Sand Play Table was just the thing she needed! 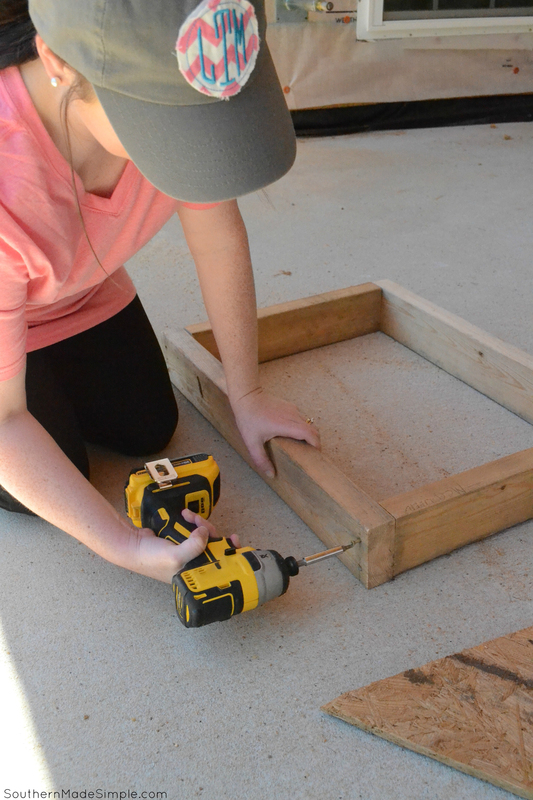 So after consulting the master carpenter of the house (aka: the hubs) to work out a few plans, we dreamed up this simple design for a portable outdoor sand table that would make playtime for our daughter way more fun. 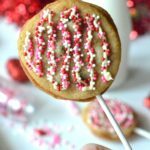 Using just under $30 worth of supplies, it was way cheaper and more efficient than buying something similar at a store! 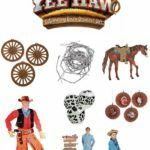 Visit the link posted below to see the complete cut list and full assembly instructions. It’s important to note before you begin assembly that we designed the legs of this table to fit the height of our 2 year old. If you’ll be building this table for an older child, you might want to consider making the legs a bit longer to adjust to their height. 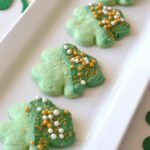 After I assembled the sand table, I headed out to my local Walmart to pick up a bag of play sand (50 lb bag), beach toys and a few other essentials we’d need to make our play time outside extra fun! 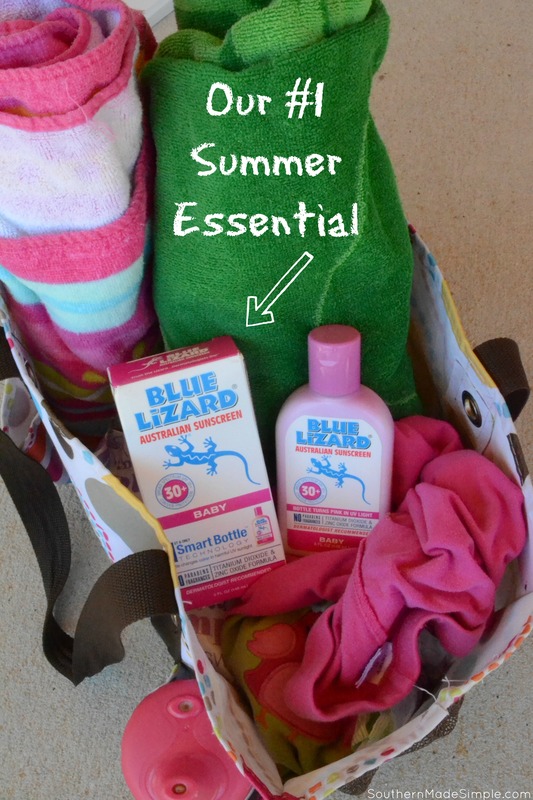 The first thing on my list was to pick up a bottle of Blue Lizard® Australian Sunscreen for my baby girl. 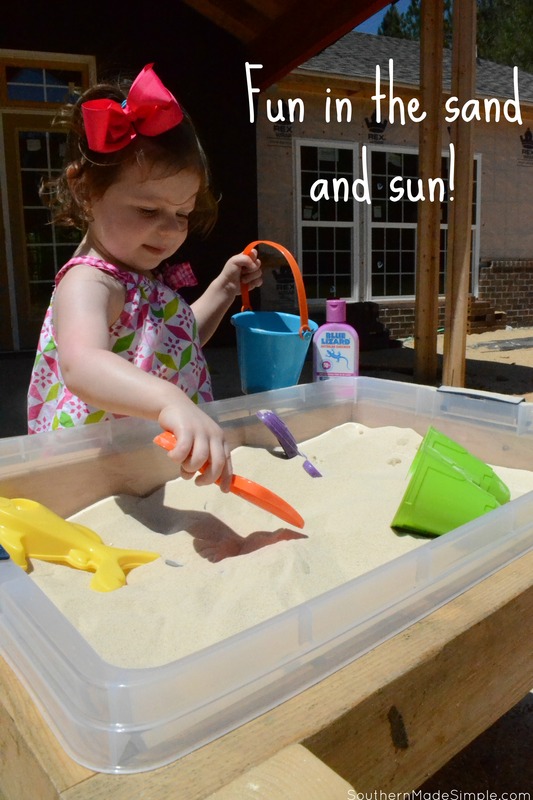 It’s so important to apply sunscreen before outdoor play, no matter how long the child may be outside. With the sun beating down as hard as it’s been lately, I knew a sunburn on her precious skin was inevitable if I didn’t stock up on the SPF! 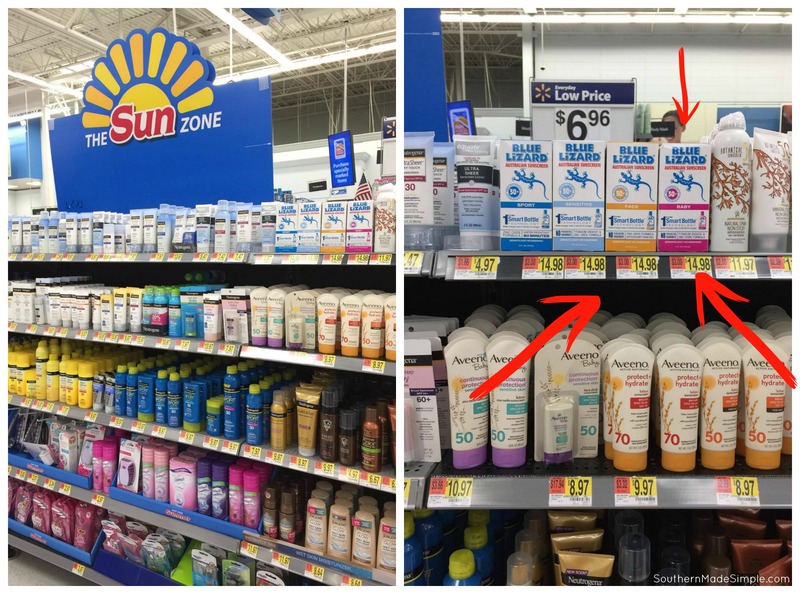 During my shopping trip at Walmart, I saw this giant center-aisle display appropriately named “The Sun Zone” where all of the sunscreen was conveniently on display. I immediately looked for the cute little blue lizard and spotted the Blue Lizard® Baby Sunscreen right on the top shelf! I bypass the other products and head straight for this one for many reasons, but specifically because it’s formulated especially for baby’s delicate skin, is paraben and fragrance free, and it’s been trusted by pediatricians and recommended by dermatologists for over 15 years. 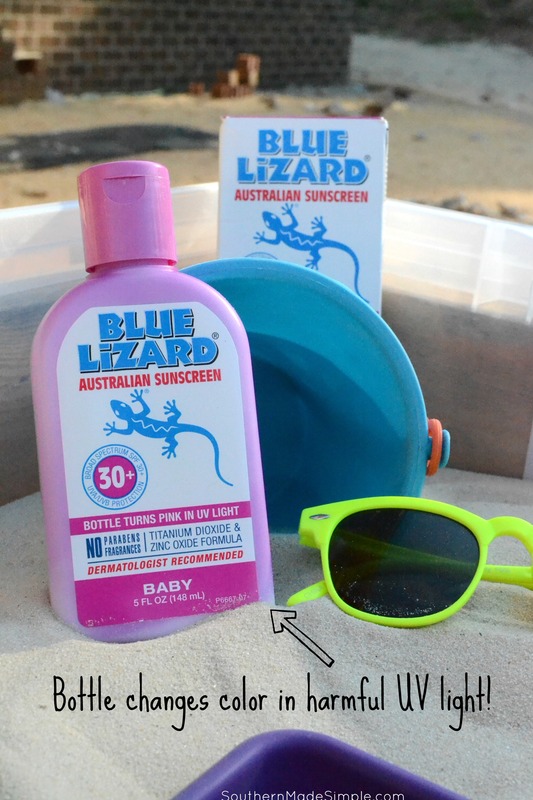 Blue Lizard® also has a unique zinc-oxide formulation with broad spectrum UVA/UVB protection that I 100% trust. I’ve often worried if the other sunscreens that I put on my baby were really protecting her, but I’ve never been disappointed with the performance of Blue Lizard®! Before we started playing, we sat down together and put on our Blue Lizard® sunscreen. I’ve been working hard with my daughter to establish a routine of always putting on sunscreen before playing out in the sun. 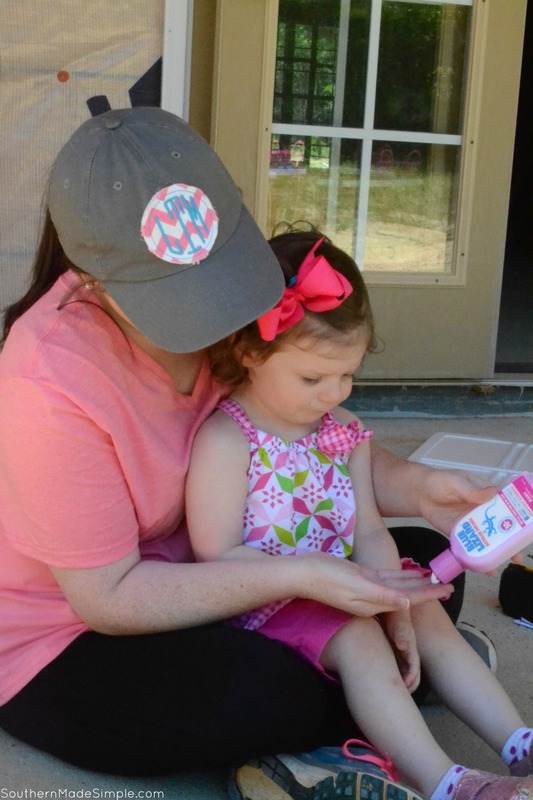 Even though she’s only two, she understands when it’s time to apply sunscreen and that not putting it on can enable to sun to give our skin one big “ouchie.” Sunscreen is always a must if we want to play outside! *Note: It’s recommended for children over the age of 6 months to use the Blue Lizard® Baby or Sensitive formulas to minimize the risk of skin sensitivity. Parents should always consult with their pediatrician before using any sunscreen on a child younger than 6 months old. 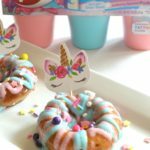 My little has really been enjoying playing in her new sand box, and I’ve been enjoying watching her imagination really take off as she digs for buried treasures, bakes “sand cupcakes” and wiggles her little fingers in the sand. No gravel, no bugs, and no worries! I can also rest much easier knowing she’s protected from the sun and can play for longer periods of time without getting sun burned. 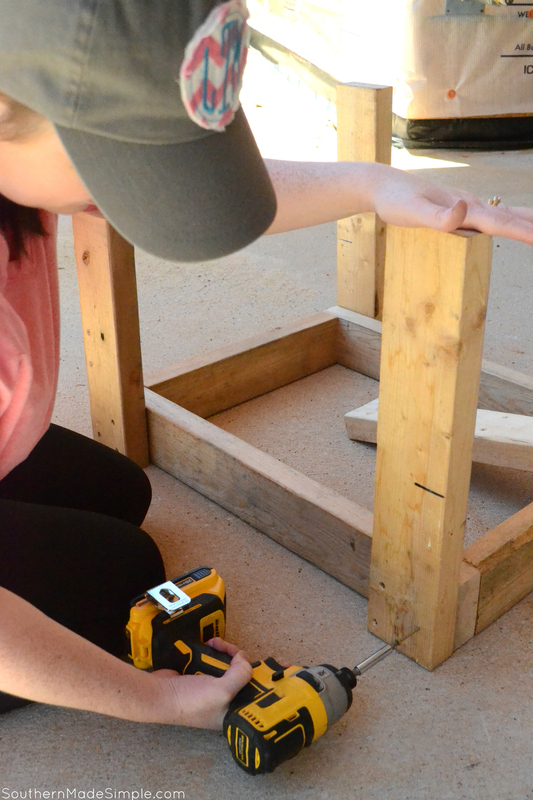 Construction sites aren’t always the most fun for kids to play at, but building this DIY Sand Play Table has really added a new element of fun to our days! What fun activities is your family participating in this summer? Will you be having fun in the sand and the sun like us? If so, don’t forget to pick up a bottle of Blue Lizard® sunscreen to keep on hand while you enjoy the summer rays! 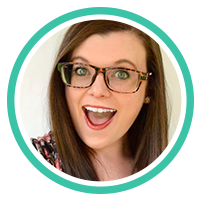 Previous Post: « Is Your Toddler Ready for the Pool this Summer?